What is the appropriate workout routine for curvy women? What is the appropriate clothing for curvy women? These are some of the questions that people keep asking online. This article will explain how to go about choosing the dresses for curvy women to help you bring out your best features while creating a proportional overall image. Curvy Body Type – What does it mean? There is a general controversy surrounding the exact meaning of the term “curvy”. This emanates from the use of the term “curvy” by teen magazines to describe “fat” or “chubby” ladies. This helps them to serve their audience without offending their overweight adolescent consumers even though it diverts from the traditional definition of the term curvy. In this traditional context, the term “curvy” describes a woman who has a bigger bust, trim waist, and round huge hips and butts. This seems to be in line with the description for the hourglass body type even though some beauty experts and fashion designers are of the opinion that the women in the pear body shape category can be described as “curvy”. This attributes give the curvy body type an “X” shape which some people like to refer to as figure 8. Women with the curvy body type also tend to have lots of muscles and have strong bones and as Marie Savard, MD, the author of Apples and Pears – The Body Shape Solution for Weight Loss and Wellness points out they tend to deposit fat in both the upper and lower halves with the buttocks, arms, chest and hips storing fast before the abdomen and the waist. If you have curvy body type, then you ride the same boat with Kim Kardashian, Halle Berry and Shania Twain, not to forget Kate Winslet. 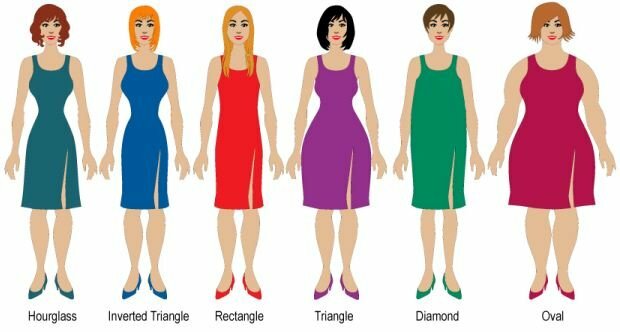 Knowing your body type is one thing but choosing the right dresses for your specific body type is another. The question to set the pace forward in that regard then is: what are the ideal dresses for curvy women? Well, before going into the specifics choices, the overall goal should be to reduce bulk while drawing attention to the most desirable feature of the curvy women: their small waist. This is an important factor to consider while choosing both the fabrics and the clothing styles. With that in mind, you can never go wrong with a fitting dress that nip at the waist to accentuate it but pay close attention not to add bulk to your bosom. A wrap dress is in particular a splendid option in that context but may not be a safe bet if you have a short waist. As for the fabric, your best bet would be soft, stretchy materials the likes of silk since they flow along with your natural curves unlike their stiff alternatives that may make you end up looking boxy. Moving forward to the neckline in as far as dresses for curvy women are concerned, your safest bets would be scoop necks, V-necks and sweethearts which are cut down to impart a slimming effect to your bosom. Avoid wide necklines (think of squares and boat necks for example) as they can add bulk to your shoulders and bucks and make your upper half appear heavy. The same case applies to bows and ruffles since they as well add bulk to the upper half when located on the bust and lower half when located on the hip. For women who like to de-emphasize their curves, you can hardly go wrong with dresses with vertical stripes or pleats. Moving on to the lower body clothes for curvy women, you need to keep in mind the goal for dressing this body type: emphasizing your narrow waist and those natural feminine curves. Snug-fitting pencil skirts are a fantastic choice for curvy women since they do a great job at accentuating your natural, feminine curves. Any other type of skirt will as well do the job but you should consider keeping them at knee-length. You will also want to stay away from stiff fabrics as they might make you appear too boxy and wide and instead choose stretchy or draping materials. Moving forwards to trousers for the curvy women, you can hardly go wrong with slightly-flared styles. The flares help to balance out your features for a more proportional overall look. It also helps to give the illusion of longer, slimmer legs. One great example is the boot-cut style. A talk about lower body clothes for curvy women is hardly complete without saying something good about round toe shoes, bowed shoes, and peep toe shoes which all help to accentuate your natural curves. You will however want to stay away from flat lace-up shoes as they don’t do your curvy body type any good. Curvy women tend to build muscle mass rather quickly and an ideal curvy body workout should initially cut down on weight training to allow time for much of the body fat to be burned off. Once that has happened, you can then introduce weight training. A good curvy body workout routing should incorporate high speed sports with low to moderate resistance. Both the upper and lower halves of the body should be the target area for such sports. Some of the options to choose from are upright rows, vertical scissors, leg lifts, leg curls, arm push-outs, L-kicks, bicep curls, behind the neck presses, leg-outs, and triceps kickbacks. Other exercise to incorporate into your workout routine are treadmill walks (high speed; no inline), swimming (front crawl), and biking (low-resistance).